Lou Gehrig at bat during the New York Yankees exhibition at Travelers Field in Little Rock on April 9th, 1939. 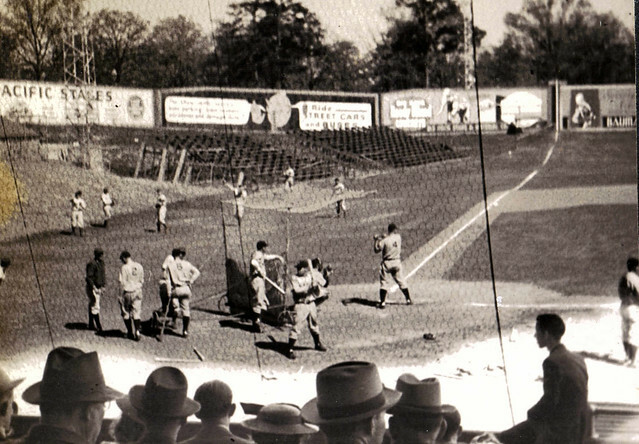 The New York Yankees played numerous Exhibition Games in Little Rock, AR between 1929-1941. 4/7/1930 Kavanaugh Field, Little Rock, AR Little Rock Travelers 5 New York Yankees 7 6,000 Combs, Gehrig, Lazzeri, Dickey. 4/10/1937 Travelers Field, Little Rock, AR Little Rock Travelers 9 New York Yankees 8 4,500 Gehrig, Dickey, DiMaggio, Lazzeri. 4/9/1938 Travelers Field, Little Rock, AR Little Rock Travelers 5 New York Yankees 10 2,500 Gerhig, Gordon, Dickey. 4/8/1939 Travelers Field, Little Rock, AR Little Rock Travelers 5 New York Yankees 4 3,000 DiMaggio, Gehrig, Dickey, Gordon, Ruffing. 4/9/1939 Travelers Field, Little Rock, AR Little Rock Travelers 0 New York Yankees 8 6,877 DiMaggio, Gehrig, Dickey, Gordon, Gomez. 4/5/1940 Travelers Field, Little Rock, AR Little Rock Travelers 1 New York Yankees 11 3,000 DiMaggio, Dickey, Gordon, Gomez. 4/4/1941 Travelers Field, Little Rock, AR Little Rock Travelers 4 New York Yankees 5 4,000 DiMaggio, Gordon, Ruffing.